This official Adobe tutorial shows photographers and photography students how to use Adobe Lightroom and Photoshop CC together to get results and efficiencies they could never achieve with either product alone. 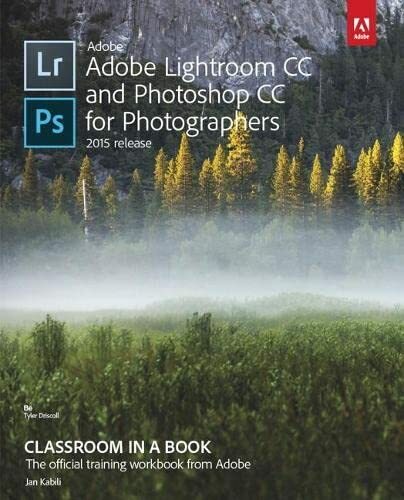 Adobe Lightroom and Photoshop CC for Photographers Classroom in a Book (R) begins by presenting a quick, hands-on overview of Lightroom's powerful cataloging functions, perfect for readers who've used a different photo organization tool (or none at all!). Next, Jan Kabili introduces a simple, well-proven Lightroom-Photoshop workflow. Building on these fundamentals, she guides readers through a series of practical projects that start in Lightroom and move to Photoshop to use its powerful, exclusive tools. You'll walk through fixing common photo problems such as blur caused by camera shake; bringing out important details; adding creative effects with adjustment layers; layering images to create composites; adding text or 3D objects; performing precise photo retouching, and much more. Classroom in a Book, the best-selling series of hands-on software training workbooks, helps students learn the features of Adobe software quickly and easily. It offers what no other book or training program does: official training from Adobe Systems Incorporated, developed with the support of Adobe product experts. Online companion files include all the assets readers need to complete each chapter's projects, as well as eBook updates when Adobe releases new features for Creative Cloud customers. New to this release, all buyers of the book get full access to the Web Edition: a Web-based version of the complete eBook enhanced with video and interactive multiple-choice quizzes. As with all Classroom in a Book products, Instructor Notes are available for teachers to download. Check out the ad in the back of the book for details on becoming an Adobe Creative Cloud Photography plan member for up to 20% off your first year! Lesa Snider, photographer and founder of PhotoLesa.com, is on a mission to teach the world to create better imagery. She's the author of Photoshop CC: The Missing Manual; Photos for Mac and iOS: The Missing Manual; and The Skinny series of ebooks (photolesa.com/books). Lesa has recorded over 40 video courses (photolesa.com/videos) on topics such as image editing, graphic design, and stock photography. Her tutorials are featured on Adobe.com (http: //lesa.in/adobetuts), and she writes a weekly column for Macworld.com (www.macworld.com/author/Lesa-Snider/), the "Beginner's Workshop" column for Photoshop User magazine, and monthly features for Photo Elements Techniques magazine (www.photoshopelementsuser.com). She lives in Boulder, Colorado, with her husband, Jay Nelson, and their four feisty felines. Lesa is chasing a black belt in Muay Thai kickboxing, as well as Ozzy Osbourne's autograph. You can connect with her online on Twitter at @PhotoLesa or at Facebook.com/Photolesa.